miss the Korg sounds - brilliant. even with all the new technology today. i want one of those!!! is it still up chris? i guess that's a no...thanks. Since this is a generic Korg OASYS thread, I presume I have to ask the following question here. Presently I'm using two Korg OASYS PCI cards: one in a Power Mac 9600 and one in a Power Mac G4. The problem is, I'd like to use the OASYS hosted in the G4 as an external hardware linked via MIDI to my main DAW (a MacBook Pro running Logic Pro X), like I'm already doing with the OASYS hosted in the Power Mac 9600: is it possible? The G4 though has USB ports though, not serial, so I was hoping to find a method through OMS, but I'm still struggling. Perhaps someone here has already faced and solved the problem? Thanks for the reply, MacTron. You mean a Stealth Serial Port for G4? Hard to find — actually it's a couple of years I'm looking for it. Also, what do you mean exactly with "use MIDI over USB"? I was hoping I could circumvent this through OMS. Sorry, I always try to help, but my bad english sometimes don't let me do it . Audio, Vision DSP, and Studio Vision Pro. OMS needs the OASYS PCI OMS Driver to communicate with the OASYS PCI. the OASYS PCI OMS Driver. 1. Open the OASYS PCI Editor program. 3. Click on the MIDI/Global tab. The MIDI/Global preferences page will appear. 4. Set the MIDI System parameter to OMS. The OASYS PCI will now use OMS as its MIDI system. 1. Open the OMS Setup application. The current OMS Studio Setup document will be opened. 2. 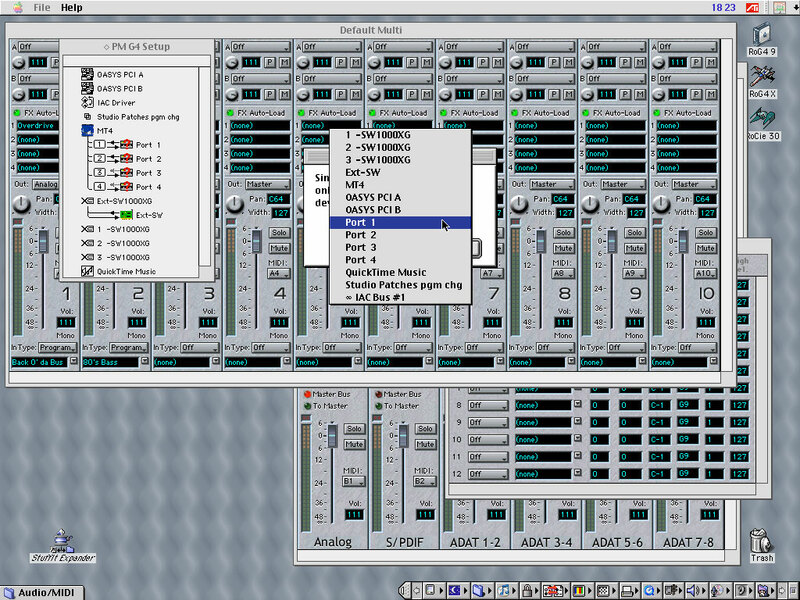 In the Studio menu, select MIDI Cards & Interfaces. 3. Click the Update Setup button. The OMS Driver Search window will appear. 4. De-select all of the serial ports. 6. In the Edit menu, select OMS MIDI Setup. The OMS MIDI Setup dialog will appear. 7. Enable the “Run MIDI in Background” checkbox. MIDI sequencer to the OASYS PCI Editor will cause the sequencer to stop playing. MIDI from your controller keyboard) to the OASYS PCI. 8. Save the edited OMS setup. PCIA and OASYS PCIB, for a total of 32 MIDI channels. 4. Turn off the “Editor Responds to OMS/FreeMIDI Controllers” checkbox. programs, such as an OMS sequencer. hung notes, and notes cutting off prematurely. 5. In the OMS sequencer, enable MIDI patch through. 6.Read the OASYS PCI FAQ for more information on specific OMS programs. 4. Turn on the “Editor Responds to OMS/FreeMIDI Controllers” checkbox. This is similar to the Local On/Off parameter found on some synthesizers. Thanks for the reminder. This unfortunately doesn't help, though, because what I'm trying to do is using the OASYS in the G4 as an external hardware linked via MIDI to a separated DAW running a sequencer (that is, as if the OASYS and the G4 hosting the card were one sound module). These instructions instead explain how to link the OASYS to software residing in the same machine (more or less like the OASYS were a virtual instrument for a sequencer residing in the same computer), or to use it with a MIDI interface connected to the serial port (which the G4 doesn't feature). I'd need to have the OASYS responding to MIDI input from the MIDI interface (connected to the G4's USB port) — like I'm already doing with the OASYS residing in the Power Mac 9600. Presently the only way I found is by catching the MIDI input in Cubase VST/32 (installed in the G4) which passes on the MIDI to the OASYS: it works, but with the toll of a high latency. I'd like to get rid of Cubase and control the OASYS directly through OMS. May be "OMS Preferred Device" or "Direct OMS" (attached) can do what you need. May be "OMS Preferred Device"
A big thank you, I forgot about OMS Preferred Device (actually I never used it before, because I never needed it), limiting my attempts only within OMS Setup and the OASYS Editor. Leaving "OMS" as MIDI System in the OASYS Editor, and choosing "Port 1" in the OMS Preferred Device panel, forced the OASYS to use Port 1 of the Emagic MT4 USB MIDI interface (http://www.giannotta.eu/photolink/OMSPreferred.jpg). Robgian I have done this in the past - what you will need is keyboard that has usb drivers for Macosx and also has midi ports - I used a Korg Kontrol49 which also had midi-in, midi-out and midi-thru(I used this). Not sure if it has drivers for the current OSX Mavericks though? The drivers of the Korg Kontrol49 in OSX opened up the midi ports as well - this allowed many different types of midi routing. Check to see if your USB keyboard has midi ports as well and whether they are opened up in your app you use. Anyway once set up in OSX in your app then you can use a midi interface from your G4 and use the midi ports of your midi interface to connect to the OSX computer via midi ports of your keyboard. Midi from keyboard USB into OSX then gets sent through midi-thru/midi-out port of your USB keyboard to G4 midi interface into G4 Oasys then audio comes back into your audio interface in OSX. You will just have to do some trial and error with the midi interfaces you use and see whether they do show up. Is that easy to understand? Let me know. is anyone using the macs sound out and the oasys pci card at the same time? i remember logic kept crashing, whole system froze on me if i tried to use the audio out. i can't remember, but i don't think any system audio would work, i was also trying to use turbo synth and some other programs if i remember right. instead of the apple sound manager. Those were solid cards for me - the oasys Pci. The drivers were also very well written. Audio out of what - the Oasys or the system? When using Oasys it's a good idea to make Oasys the ASIO card and keep apple sound manager for the system audio. audio it became available for the app you were using - sometimes after a restart and rebuild - since the system would become flaky. there must have been conflicts. Robegian.... Did you get that remote working? I have this set up using Studio Vision to bus the G4's in port to the Oasys hosted therein. Logic 4 also is good. Also if needing midi over LAN in OSX, get IPMIDI which is free. does anyone know if its still possible to obtain SynthKit for the Oasys? I havent been able to find it anywhere. I found the site of the Korg guy who has a bunch of patches on his site, but he very clearly states he doesnt want to be contacted about Oasys anymore. Wondering if anybody might be able to help me out there. According to some, Korg will still send it to you. How can I get SynthKit? 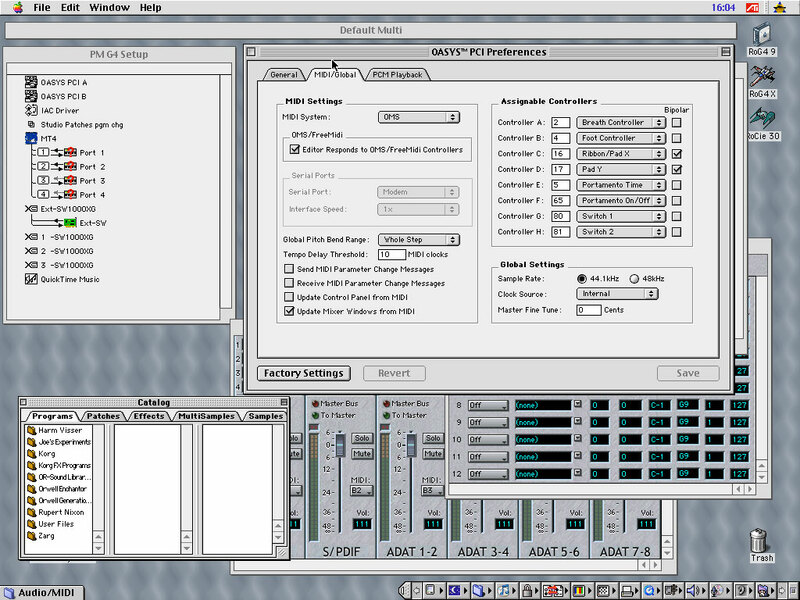 SynthKit is the MacOS program used to create all of the synthesizer and effects plug-ins for OASYS PCI. It is a fairly complex program, developed for internal use by Korg's DSP engineers. SynthKit is not publicly released, and is not part of the OASYS PCI product, but it is available to OASYS PCI users and plug-in developers as beta software. 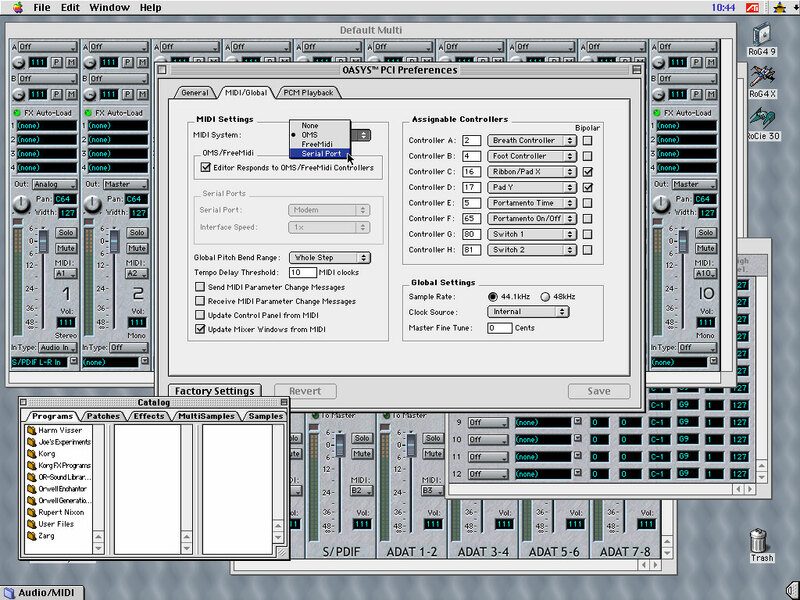 Please note that SynthKit is available for MacOS only; no Windows version is planned. Thanks for contacting Korg USA Product Support. We no longer have this kit available but I was able to locate a few links online to the different plugins. Just to add to this thread, took delivery of an OASYS a few weeks ago, and its now up and running in my MDD. As above - the sound of this card is something else. It rips through a mix - I'm not sure what the Korg magic is there but its performant. well since Korg themselves no longer have it, maybe it might be a good addition to the macintosh garden at this point? i'd still love to get a copy of it somehow. Looks like most of these links are dead. Does anyone have any of these plugins they can post for download? I have a lot of the third-party patches also but it will take me a few more days to find them, I've got a lot going on right now. dang, great work metrophage - youve been uploading some real gems! thanks!